This past weekend, as my family and I got ready to take our first real vacation of the year, a long-awaited trip to the beach, I thought back to some of the earlier trips we used to take each year to visit the ocean, trips my grandparents would orchestrate and provide for the enjoyment of their children and grandchildren. With rare exception, the destination in mind was Daytona Beach, Florida and my brother and I would look forward to these annual excursions with a lot of anticipation and excitement, counting down the days until we actually were on our way to all the adventure such a trip promised. My grandfather, an early riser on any occasion, took this to the extreme on our vacations, preferring to leave out as early as possible, either to beat the traffic or, as I suspect, because he too looked forward to going as much as we did. The night before, my mother would pack everything into our old gray American Tourister suitcases (the old kind of suitcase that you had to carry by the handle and which could survive a nuclear blast unscathed) and set these by the door. We could take a couple of our personal items if wanted but we had to be frugal in our packing because space was always limited. She would try to get us to go to bed early that night and this was the one night other than Christmas Eve that she could count on our full cooperation to oblige her. In what seemed like no time, she was shaking us awake and after a moment of disorientation, we would arise in total darkness, brush our teeth, get dressed and go wait in the breakfast room for my grandfather to arrive in his car. He was usually very punctual and when we saw car headlights coming down the street, we knew it was him because no one else would have any reason to be driving down our street at 5:00 AM. The enormous Cadillac Sedan DeVille pulled into the driveway, followed by my Aunt Charlotte’s car and he would blow the horn, despite the fact that my brother and I were usually standing outside the garage at the first sign of headlights. The trunk would pop open and the game of getting the luggage to fit in the remaining space would begin. There always seemed to be more luggage than space, even in those mammoth sized cars of the 1960’s and 1970’s, but we always managed to get it in there somehow and off we would go in the dark hours before dawn. The first few hours of travel time were usually quiet. My mother drove his car most of the time and he served as navigator from then on, giving instructions from the front seat. He remarked many times in my life that she was the best driver he had ever seen and he preferred her steady foot on the accelerator over my aunt’s tendency to press, then release the gas pedal. My brother and I would sit in the sofa-sized backseat with our grandmother, he usually ending up asleep with his head in her lap while I stared out the window at the tractor-trailers that we passed and which seemed to be the only thing on the interstate that time of the day. With light traffic and my mother’s foot on the gas, we usually made very good time and we could usually count on making our first ritual about the time the sun was rising, which was breakfast at the Green Frog restaurant near Adel Georgia. 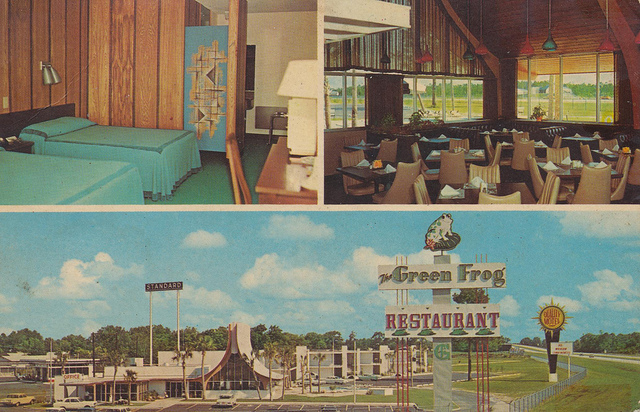 The Green Frog complex included a little bit of everything; food, gas, lodging, a gift store and probably other stuff that we didn’t ever get to experience. As the sun rose red in the sky and the temperature along with it, we consumed a hot breakfast of pancakes, eggs, sausage and bacon while my grandfather (and oftentimes me if I could get away with it) would drink coffee and chat with the owner, a man he somehow knew, probably from his many travels southward. Once the cars and the family were fueled up with a hot breakfast, we started the second leg of the journey and the longest one because once the sun was up, time seemed to slow down and the hours before the destination was reached seemed to stretch off into the same infinity that the rows of orange trees alongside the road did. We tended to leave the interstate around Lake City, Florida and would usually get on the highway that ran due south in about as straight a line as possible. I don’t think there were any curves on that road and very little to look at except orange groves and the occasional fruit or honey stand along the way. We invariably would stop along the way at the same fruit stand each year and leave with a supply of fresh honey and some fruit to consume during the vacation. The proprietors of the fruit stand were also old friends of my grandparents and apparently looked forward to the annual stop along the way, often giving us children some kind of treat from among their wares. Eventually we were back on our way again and the anticipation would begin to build as we finally saw signs indicating various attractions and things to do in Daytona Beach, usually telling us how many miles away we were. The tension would build and we would will our mother to somehow get us there faster. The most exciting part of that day would be our first glimpse of the ocean, usually as we were heading straight toward it. It would suddenly appear on the horizon between buildings as we went over a bridge and just as suddenly disappear but we knew with that first sighting of it that we had arrived. We would turn on the main street and head down the wide multi-lane street, hotels and the ocean on our left, shopping and eating venues on our right. In the gaps between the hotels, we would stare longingly at the ocean and the beach, observing the people on them and hoping that there would still be some ocean and sand left by the time we got to it. We passed by famous landmarks such as Julian’s restaurant, one of our favorite places to eat in Daytona and the Plaza hotel, a place we never stayed but for some reason was very well-known in the area. In our earliest trips, we always stayed in the Belvedere but in the early 1970’s, the LaPlaya Hotel became the choice of hotel for our family. The first time we stayed at the LaPlaya it was brand new; in fact, the hotel’s top floors were not even finished at the time we unloaded our luggage that year. Once the cars were empty and the two rooms, complete with an adjoining kitchenette had been filled with all our stuff, we quickly changed and headed out with our grandfather and my mother to the wide sandy beach and the Atlantic Ocean beyond. He would take the four of us, my two first cousins, my brother and I, out into the water and we would enjoy our first taste of salt water, ride the waves that came in and build sand castles while all around us, the busy beach hummed with life from the people, the cars going back and forth on the sand and the planes flying over dragging an assortment of advertising banners behind them. After we had been Baptized in the sun and spray, we would go take a dip in the huge pool, complete with a 14 foot deep end and a high diving board that you would never see today in a hotel, then it was off somewhere to dinner, usually Julian’s, the Red Snapper or some other local eatery. Breakfast was usually at the IHOP and we would eat lunch at the hotel in our kitchenette. At least one shopping excursion to the local beach store (conveniently located across from the LaPlaya in a new shopping center) took place early so that we could get our blowup rafts, rubber sharks, life rings and you name it. My grandfather always made sure we had a great trip and although his idea of a vacation was to sit on the balcony and drink a cold beer, he could always be persuaded to take us down to the beach if we wanted to go and to make sure his family got a great meal out on the town in the evening. Not all the experiences were good. My mother taking me and my two older cousins to see a new movie called “Jaws” while we were in Daytona was one of them I would prefer to forget. Getting caught in a strong rip current once was another one and thank the good Lord that my grandfather, even in his early 70’s then, was still in excellent physical condition and very strong, pulling me quickly from the water before I went down for good. Those kind of things were very rare though and in the overall scheme of things, just a small part of a larger experience of good memories and fun. These trips took place each year and for my family, became the stuff that treasured memories are made from. Although we occasionally deviated from the usual traditions such as going to Panama City once in a while or to the then-new Walt Disney World in Orlando, Daytona seemed to be the favored spot for all of us and held with it the promise of fun, good times, great food and lasting memories. My last regular trip to Daytona took place during my senior year in high school and after that, I didn’t see Daytona Beach again for nearly twenty years. Much had changed but places like Julian’s restaurant and the LaPlaya were still there and looked much the same. It was a one time only trip, replaced today by trips such as the one I’m on now, enjoying being with other cousins, my mother and my own wife and son at a different beach and on a different ocean….still, I look back and remember those good times and all that we did, the people who went and who are no longer with us, that did their best to make sure we had a vacation worth remembering. Thank you for those memories…. Wonderful article, Michael! I hope your present vacaton can live up to those memories…you are making memories for the younger generations now. Thank you Lynne…so far they are and we’re having a great time!Looking forward to seeing you a bit later too! How your article brought back memories of my childhood in Daytona. We went every year but we took a right turn instead of left where the ocean and hotels were on our left. We stayed at the Royal Arms which has since been torn down. I met my husband there when I was 12 and he was 13 (he was from New Jersey) and after the second year of meeting his family there I didn’t see him again until I had graduated from high school. Eventually he moved to Georgia, we started dating and married a couple of years later. 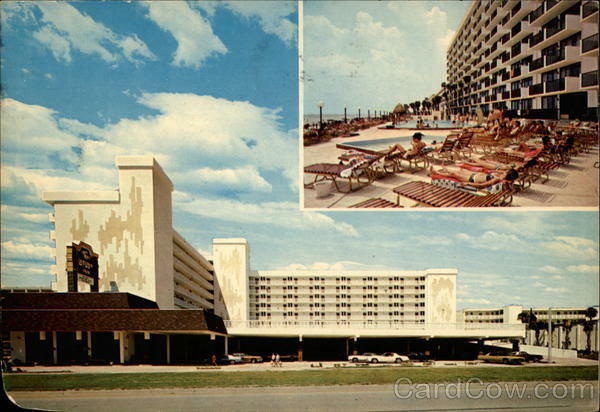 We honeymooned in Daytona (but not at the Royal Arms) and then ended up taking our children there for many years and stayed in the same room that my family stayed in for so many years! Oh how I miss that place. We have been back several time and stayed at a new hotel, but it really was never the same. Haven’t been there since the year before my husband died and I really miss it! To me, Daytona is THE vacation spot and if I had my wishes (and the finances) I would buy the private home that was next door to the Royal Arms and move down there immediately. Thank you Gail…I’m glad that you enjoyed the article and it sounds like you have a wealth of great memories too. Those were great times for my family and I wouldn’t take anything for them. I had my directions wrong too…we actually turned right and the hotels were on the left so I will edit that in the article. Thanks again for reading! Really loved this one Mike. You draw such a great picture in MY minds eye! I surely did smile at the reference to your Mom’s steady foot. Many of our family members tell me the same thing about my skills. They prefer my driving to David’s as he obviously inherited his Mother’s foot action!